Novi Sad is city of wide boulevards, magnificent buildings, many parks and greenery, arranged streets and quite number of places for rest and entertainment. With almost 400.000 citizens including surrounding estates city is positioned around left bank of Danube. 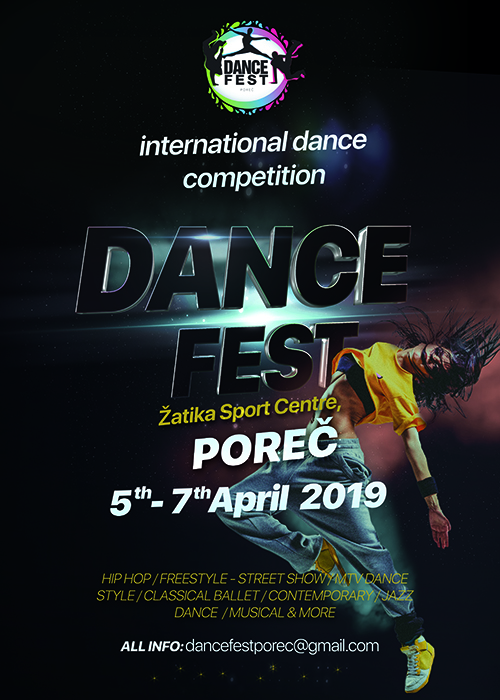 Motivated with good energy and positive reactions it is our pleasure to invite you to participate on our first DANCE FEST POREČ wich will be held on Friday, Saturday and Sunday 5th, 6th and 7th of April, 2019. in Žatika sport centre hall. Dance Fest Poreč is festival that celebrates quality and diversity of dance styles through live performance and workshops. We are introducing to you fusion of young dancers, future and allready well known artist and some of aknowlidged world class dancers and choreographers. We are promising excellent teachers and world judges, entertainment and dance competition that takes your breath away, celebrating Gala evening and incredible rewards! WINNER DFP 2019 - First prize 3000 euros, sponsorship rewards and much more! We are aware how is important for young dancers to perform, connect with other dancers, travel, meet with other cultures and widen their horizons through dancing. We encourage you to participate because dance education is best through live performing and extremely useful for all individuals in different stages od dance development. We are hoping that you are going to join us in Poreč and therefore widen your knowledgde of dancing and create new connections and memories for a lifetime. If you have any questions do not hesitate to ask and we will do everything to make this expirience unforgettable. We wish you welcome to our city of Poreč, looking forward to see your skills at stage. Organizer reserves the right to change the program. Register and become part of dance history.